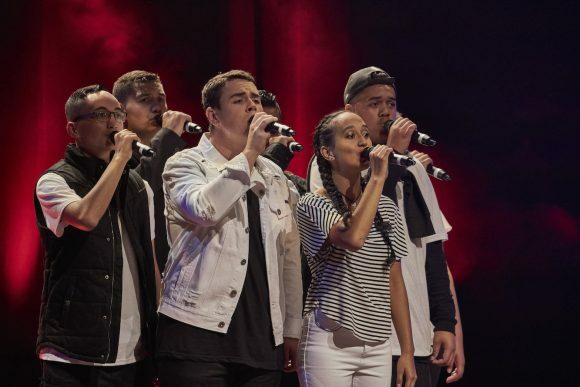 TVNZ 1 will try to boost its weekend ratings with the return of Britain’s Got Talent and the premiere of The Naked Choir. BGT will form a two-and-a-half hour Saturday night variety block with another ITV talent show, The Next Great Magician, from April 29. The latter premieres this weekend at 7.00 with a double episode but thereafter will screen around 8.20, after BGT. The rejig marks a move away from the lifestyle fare that’s dominated Saturday evenings, with one of the most disastrous line-ups being this year’s Outback Pilots, Te Radar’s Chequered Past and Inside Out Homes (which has been ditched after only three weeks — one week short of its full run). The change was signalled recently in the trade publication C21, which reported “TVNZ 1 is revamping weekends as it looks to stem the decline in free-to-air audiences”. It’s not the first time BGT has aired in a Saturday evening slot. Last year it was sandwiched between Hyundai Country Calendar, which now anchors Sunday nights, and Coronation Street. But this is the first time TVNZ 1 has devoted such a large block of air time to variety, a strategy that’s paid off for the BBC and ITV with shows like BGT, The Voice and Strictly Dancing. Moreover, it’s adding another hour on Sundays, with the April 30 launch of The Naked Choir, the local version of another UK format in which Jeff Hunkin, of barbershop quartet Musical Island Boys, searches for New Zealand’s most entertaining a cappella singing group. The series is named after amateur groups that are a cappella, aka the “naked” voice (i.e. without any sort of accompaniment, instruments or backing track), and tries to turn them into rounded, impressive and polished performers. Eight groups have been selected but not just on their musical ability. Because this Warner Bros NZ series is NZ On Air-funded ($1.025 million), they had to represent not just a range of musical genres — gospel, barbershop, hip hop — but also a diverse mix of communities. Each episode follows these groups as they prepare and rehearse, then come together in a (hopefully) pitch-perfect sing-off. Meanwhile, season 11 of BGT went to air this weekend in the UK, where it “debuted with near-identical viewing figures” to last year, reports The Telegraph. I doubt it Trevor that Three will invest in another local version even though I wouldn’t mind seeing it again. Wow, that’s very interesting Trevor. I’m excited for a new series of our own version. I wonder if it will air in 2018, as there has been no news about auditions and this show should be in production by now with winter fast approaching if it’s to air this year. I’m wondering if they’re going to air the UK version this year after last year’s controversial Honey G act which NZ missed out on last year. Philip, is it plausible for Three to commit to another local version after the reply Trevor received on Facebook? Are we able to get some concrete answers? I think this morning’s announcement of a second attempt at a local version of Married at First Sight has sealed the fate of an X Factor NZ revival. Seems like the Three schedule is packed with local content now and the only other opening will be in 2018 for the talent show if it’s worth the risk for the network. I’d be surprised if The X-Factor comes back. Seems like a dead format. Perhaps a local version of The Voice could work if Three nab the rights? Yes, Clint, that could be a possibility for Three, especially with the networks committing to local variations of international programme formats ie Survivor NZ.